Weaving touches you, literally touches you every day. Like that advertising slogan, it is “the fabric of your life”. The towels you use to dry yourself after your morning shower are woven. The jeans you slip on in the evening to relax are woven. The sheets you lie down on at night to sleep are, usually, woven. The fabric of your couch, chair seats, drapes, kitchen towels, and rugs are all woven. And, whether we realize it consciously or unconsciously, weaving and woven fabric not only permeates our lives, it also permeates our language, especially our metaphors. How many times have you used the phrase “woven together”, or “weaves through” to imply an integration of elements? How about that familiar warning – “Oh what a tangled web we weave when first we practice to deceive.” Even the word we use for our internet community, the “Web” refers both to the web of fabric and to the web spun by a spider, an arachnid who, by the way, gets its name from a mythical mortal, Arachne, who dared to challenge the goddess of weaving, Athena, to a contest. She lost, of course, and was turned into a spider for her hubris. Weaving is one of the oldest crafts, dating back to the Neolithic period, thousands of years before knitting was invented. Weaving was the first way humans found to clothe themselves with something other than skins and furs. Its antiquity is another reason weaving so permeates our lives, our language, and our metaphors. Weaving is primal, basic, calling to us from the beginnings of civilization. Woven means that there are vertical threads and horizontal threads crossing over and under each other to create the fabric (remember making those loop potholders as a child?). Weaving’s structure is basic and symbolic. In that physical act of horizontal over vertical the metaphysical is invoked. Within so many world religions and spiritual traditions, there is the crossing of the horizontal over the vertical – the Christian cross, the Celtic cross, the pagan cross, the Egyptian ankh, the Druidic Tree of Life, Native American traditions’ honoring of the four directions, and others – that often represents both the masculine and feminine forces, the material and the spiritual, in relationship to each other. So woven fabric is a magical cloth consisting of thousands of tiny crosses carrying the numinous energy of both the masculine and feminine, the physical and spiritual in relationship to each other – the primal and divine creative forces. When I began weaving in the 80’s, I did not understand or appreciate what magic this craft held or what it could teach me on a personal and spiritual level, at least not consciously. I must have been pulled, though, to that first weaving class by a distant memory of one of my favorite childhood Disney movies, “The Three Lives of Thomasina”. The movie takes place in early 20th century Wales and has all the makings of a fairytale. One of the central characters is a beautiful, mysterious woman played by Susan Hampshire, who lives in a cottage in the woods. All the local children think this woman is a witch because of the strange, rhythmic sounds coming from her cottage. When we finally see the inside of the cottage, we find this ethereal blonde, blue-eyed woman sitting at a large floor loom weaving away. The suspicious thumping sound is only the beat of the reed against the cloth. That image must have brewed in my creative soul for many years, for when the chance came to learn weaving, I took it. Several years later, when woven items accumulated about the house, I began to sell my work, first through the local guild, then at craft shows. More than twenty years later, my studio is filled with yarns, looms, and all the accoutrements that come with having a full-time weaving business. 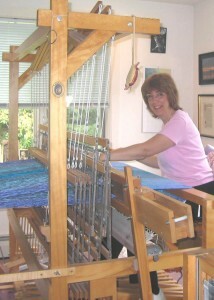 My passion for fiber, texture, color, and design found a home in the loom. Often, what is not explained when someone makes that statement is that the teacher doesn’t necessarily come in the form of a guru or wise sage. Often the teacher is a relationship with someone – a boss, a partner, a child, a friend, or even a pet. Equally often the teacher is a practice – the doing of something with commitment, consistency, focus, and endurance. In my case, weaving has been one of my primary spiritual teachers – it just took me a while to realize it. My other realization was that weaving is not something separate from all the other things I do as wife, mother, author, creativity coach, and dream worker. For years, I kept asking myself, “Is this what I am supposed to do? Or am I supposed to be a writer, or a teacher or, or , or…” Gradually, I understood that weaving is part of it all, and that it is all part of weaving; that, in fact, weaving gave me insights into all those areas and vice versa. It was, excuse the expression, all interwoven! While I may still be traveling the path to wisdom and enlightenment after all these years, at least now I know I merely have to follow the threads of a craft that stretches forward and backward in time, that joins the material with the spiritual, and I will be well on my way. So, for you, I hope that you may find the person or practice that will guide you on your spiritual path. And with each throw of the shuttle and each beat of the reed, may the fabric of your life grow more beautiful and strong. Paula Chaffee Scardamalia is a book and creativity coach, a speaker, and the award-winning author of “Weaving a Woman’s Life: Spiritual Lessons from the Loom”, inspired by her successful career as a nationally recognized professional weaver and designer. Using dreams, tarot, and rituals, she coaches women and leads group and individual retreats. Her weekly ezine, Divine Muse-ings, helps writers and other creatives stay connected to the Muse and lead an inspired, gutsy and productive creative life. You can sign up at for her newsletter or order her book at www.diviningthemuse.com.